Sometimes you just need a little something sweet. A healthy snack that helps propel you through the late afternoon, or a little pick me up between meals. Or, a healthy option when all those trays of holiday cookies start appearing in the lunch room. 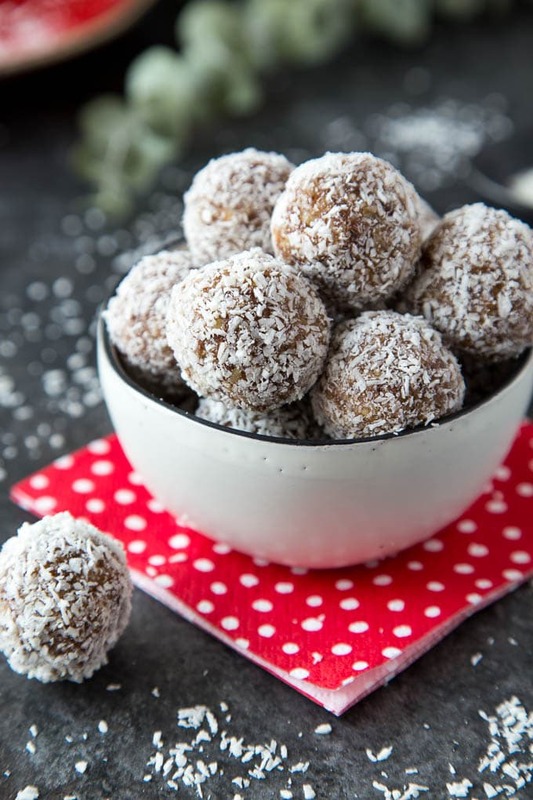 These “Snowball” Coconut Date Energy Bites are so easy! No baking involved. 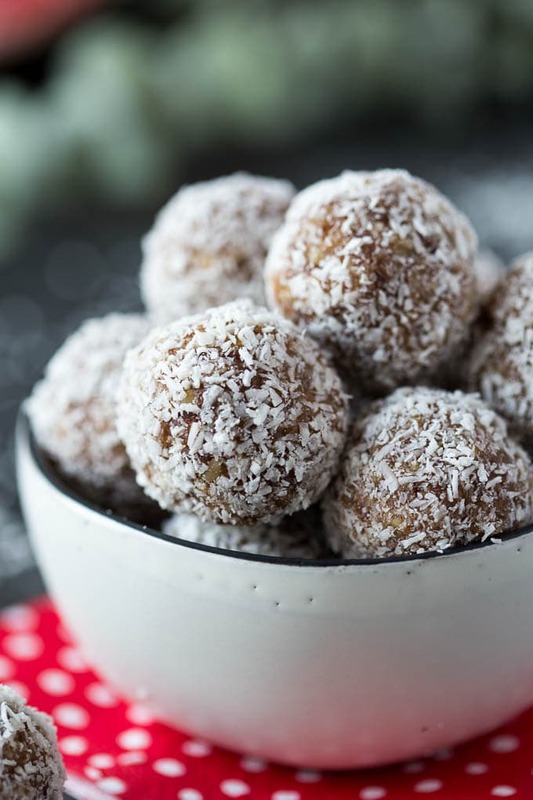 Simply add the 5 ingredients: dates, walnuts, vanilla, shredded coconut, and a touch of coconut oil to a food processor (or blender). Whiz the ingredients around until they form a thick batter. 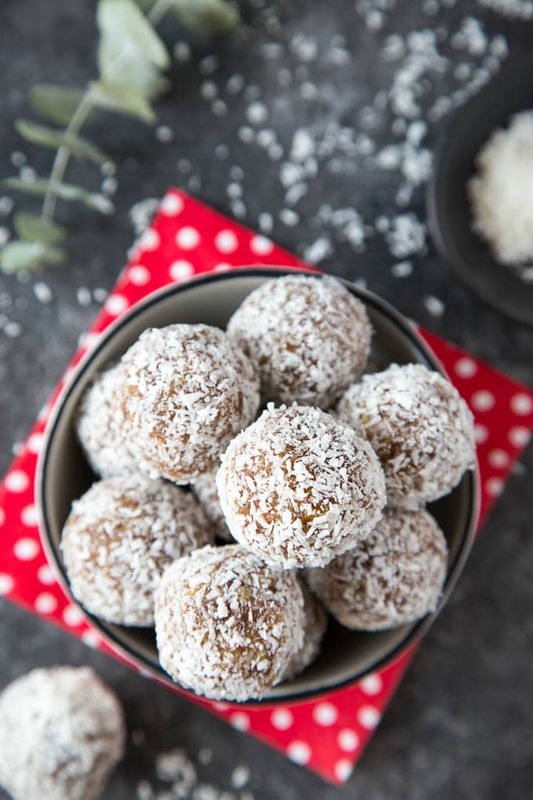 Roll them into the shape of a ball and coat with some additional shredded coconut. That’s it! They will need a few minutes in the refrigerator ( at least 15 mins.) to firm up before you pop them into your mouth but these festive treats are definitely worth the wait! 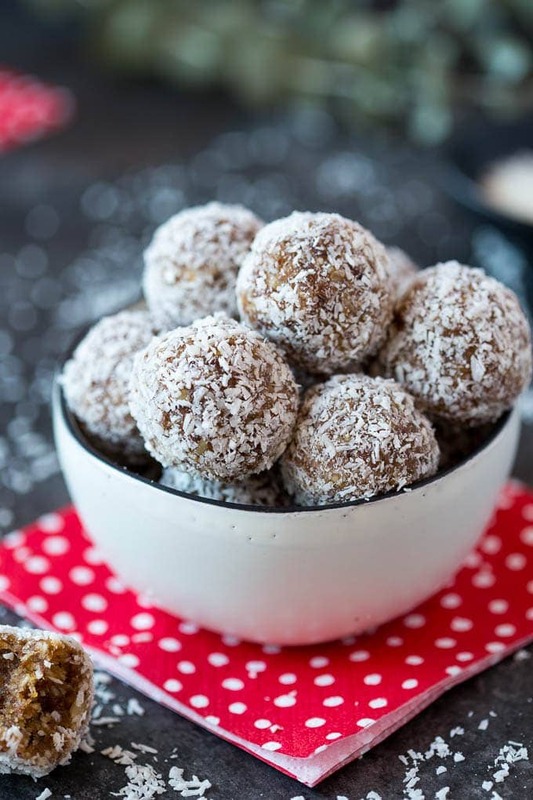 “Snowball” Coconut Date Energy Bites can be stored in the refrigerator (in an airtight container) for up to two weeks. 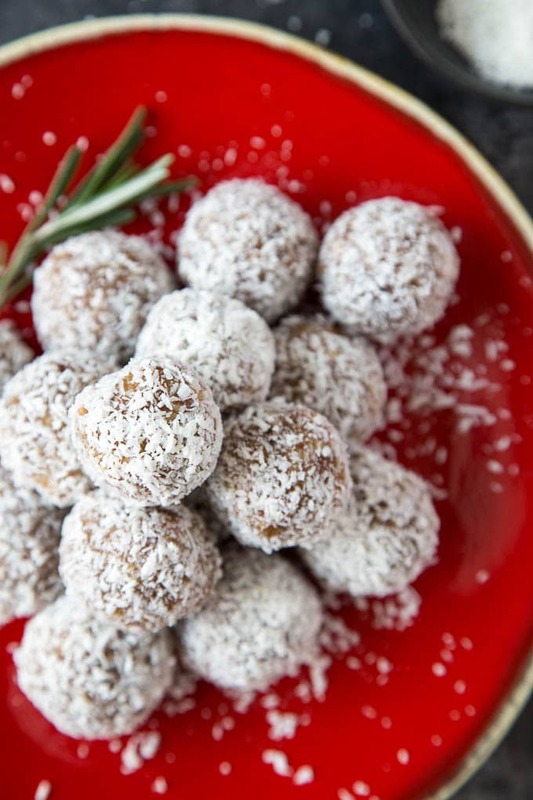 Keep some ready and at hand for when you need a guilt-free treat! 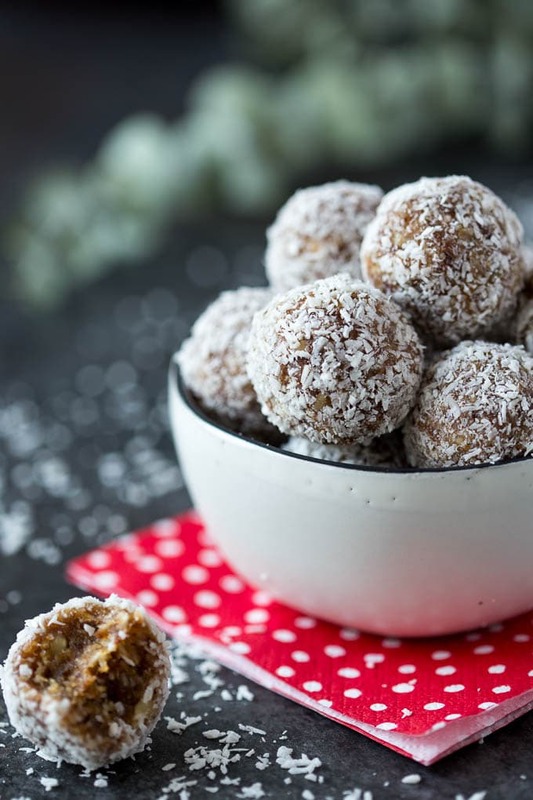 If you’re looking for other healthy energy bite options check out these White Chocolate Chip Cinnamon Roll Energy Bites or these Oats, Dark Chocolate and Peanut Butter Protein Balls. In a food processor ( or blender) , pulse the dates to create a thick paste. Add walnuts, ¼ cup shredded coconut, melted coconut oil and vanilla extract. Pulse again to incorporate and create a paste/uniform batter. Transfer paste/batter to a medium bowl. Place remaining shredded coconut (1/4 cup) in a low shallow bowl or plate. Using a spoon, scoop approx. 1 to 1½ teaspoons of paste and roll between hands to create a ball. Roll ball in shredded coconut (pressing lightly) until well covered. Place on a clean plate, repeat until all paste/batter has been formed into balls. Refrigerate until firm ( at least 15 minutes) .